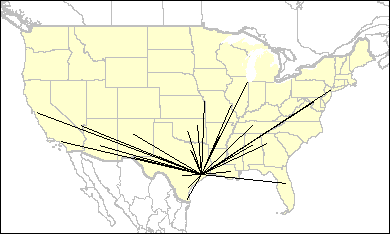 The map on the right illustrates all non stop flight from William P Hobby Airport by major air carrier. The table that then follows lists all airport destinations served from William P Hobby Airport by city, by airport, by major carrier. In addition, the number of flights, timeliness, and cancelations are also shown. Source: US Bureau of Transportation Statistics. For flight specific information please refer to the Bureau of Transportation Statistic's 'On-time Statistics Database'.